Can You Donate Your Liver If You're Still Alive? To many people, the phrase "living liver donor" may sound frightening. But did you know living liver donation is safe? After donating part of your liver, your liver will regrow and work normally again within just a few months. Most people who need a liver transplant spend months or years waiting for an organ donation from a deceased donor. Living liver donation is a better option for those with end-stage liver disease because it ensures these patients get a life-saving organ transplant when they need it. Living liver donation is safe. Your liver is an incredible organ. It actually regrows to its original size within 6 months of a living liver donation surgery. Like any surgery, the procedure does have some risks. But overall, living liver donation is safe. Our team will always act in your best interests and safety as a donor. Your liver will grow back to its full size. It takes about 6 months for your liver to fully grow back after a living liver donation surgery. Our ultimate goal is to make sure you’re just as healthy after your living donation surgery as you were before your surgery. You’ll have a complete evaluation that includes tests and screenings to make sure you’re healthy enough to donate part of your liver. The transplant team will perform psychosocial and medical tests to make sure you’ll be safe during surgery—and that you’ll stay healthy after your donation. Some of the testing you will have includes blood tests, urine tests, imaging exams of your liver, and cancer screening. 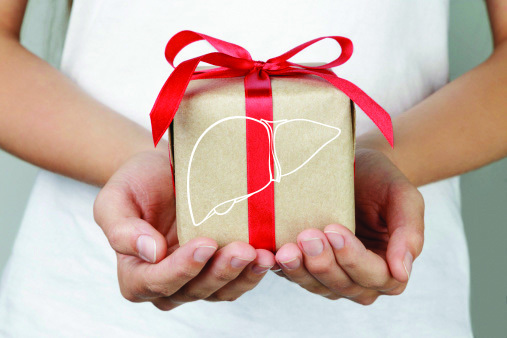 You don’t have to be related to someone to donate a lobe of your liver. In fact, you can donate to family and even friends as long as you have a close emotional connection with your recipient. Your blood type must be compatible with your recipient’s blood type. Besides being healthy, living donors must have a compatible blood type with their liver recipient. You can still have a baby. Are you hoping to have children in the future? Donating a part of your liver won’t make it harder for you to get pregnant or deliver a baby. Living donation doesn’t cause fertility problems for women or men. Still, women should wait one year after their donation surgery before they get pregnant. This gives your body the time it needs to heal. Donors don’t have to pay for their evaluation. Being a living liver donor is an incredible gift. We don’t want costs to stand in the way of your decision. As a living liver donor, the costs you’ll be responsible for are paying for “health maintenance” tests to make sure you’re healthy enough to donate a part of your live. These include (but aren't limited to) a Pap smear, mammogram, and a colonoscopy. You may also be responsible for out-of-pocket travel expenses like gas, possible airfare, or food and lodging during your evaluation. You may also need to cover any lost wages while you're recovering from surgery because not all jobs give paid vacation or sick leave. Some living donors are out of work for two to 12 weeks or more. You can get most of the screening tests you’ll need at a lab or hospital near your home. When you get closer to your surgery date, you’ll need to have an evaluation visit at University of Utah Health, where your transplant surgery will also take place. If you live outside of Utah, there are organizations that can help you pay for any travel costs. You’ll need to stay in the hospital after living liver surgery. Most living liver donors stay in the hospital for five to 10 days. The transplant team will also ask you to stay close to Salt Lake City (within 2 hours driving distance) until your surgeon decides you’re healthy enough to return home. You can talk to other living liver donors. Our living donor program can arrange for you to speak to another donor who has donated a portion of their liver. If you’re nervous or don’t know what to expect, talking to another living liver donor can help you feel more confident about your decision. Are you considering living liver donation but are worried about how much it will cost? Learn more about financial resources by reading the American Society of Transplantation's Live Donor Financial Toolkit.